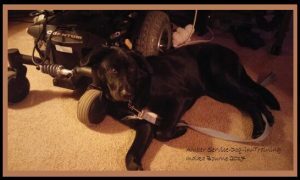 Amber service dog in training will train for another 18 to 24 months before she is a full service dog. At 8 months she is comforatable around her mans’ wheelchair as it is an extention of the disabled man she is training to assist. This post will share my opinion about those on-line company’s selling service dog vests and those take your dog anywhere laminted cards.